While trying to select lamps for my kitchen, dining room and living room; the options were so ample and all so beautiful that I had to make a list of favorites before going nuts! This task has never been so difficult when working with clients than it is for myself. Here I’ve layout some of my top choices for you to help me out. Vintage Flair: Kichler Everly Bronze 13.75″ Glass Pendant from Lamp Plus. Gillian Pendant from Joss and Main. Varaluz New Bronze Three Light Hand Forged Recycled Steel Chandelier from Bellacor. Art-Deco Inspired: Toni Pendant from Joss and Main. Vega 3 Chandelier from School House Electric Supply, Capital Lighting 4541 Ellis 18 Inch Large Pendant from 1-800 Lighting. Mystère: Bell Curve Glass Pendant Light from Shades of Light, Rae 6-light Chandelier from Overstock, Capital Lighting Axis 3 Light Globe Pendant from Wayfair. Would love to read your feedback on this selections. Which ones are your favorites? Love that one also, but the "Golden Candelabra" too. Will need another house to use all of these options. Thanks dear! Lizbeth, you and I almost selected the same ones. 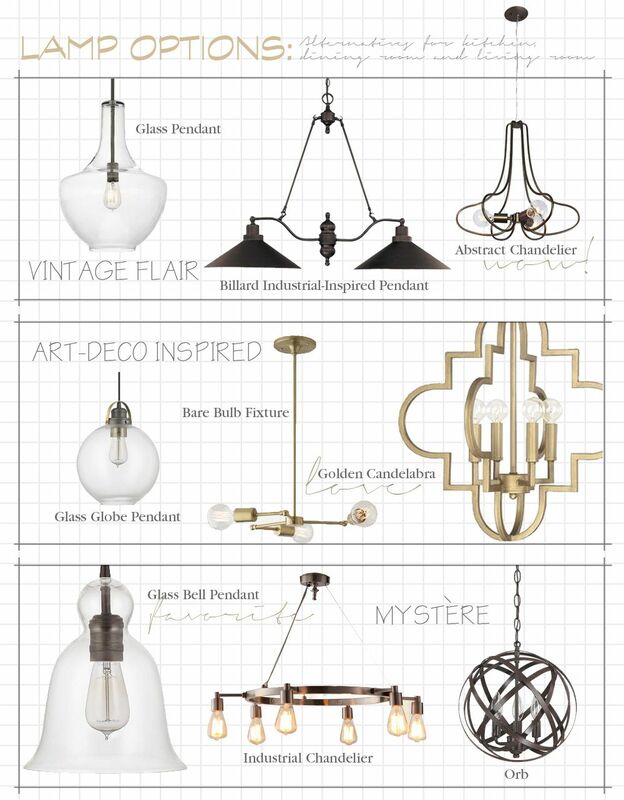 I love the Golden Candelabra and already bought the Glass Globe… I'm so obsessed with these lamps. Thanks for taking the time. Jess, I'm in between the Chandelier and Candelabra… It is soooo difficult when it is one's house. But the Glass Globe is a must and I already order it! Yay, can't wait for it to arrive! Thanks for the visit and for leaving a comment. I really appreciate this. Thanks Shavonda. I hope your are doing great on your reno project. Sending lots of positive vibes! You can add Tiffany floor lamps on your bedroom and kitchen as well. It totally change the look of your room and kitchen. I prefer to use coca cola button cap on your kitchen. It adds the beauty of your kitchen and looks really owsum.